We are extremely fortunate at Little Forest Folk Wandsworth to have two forest spaces to visit to get a real variety in our play and learning. On Mondays and Fridays our children spend their days in the Paradise Co-op Urban Farm. We have sole use of this fenced site on these days and enjoy pond dipping, gardening and growing our own plants and vegetables. 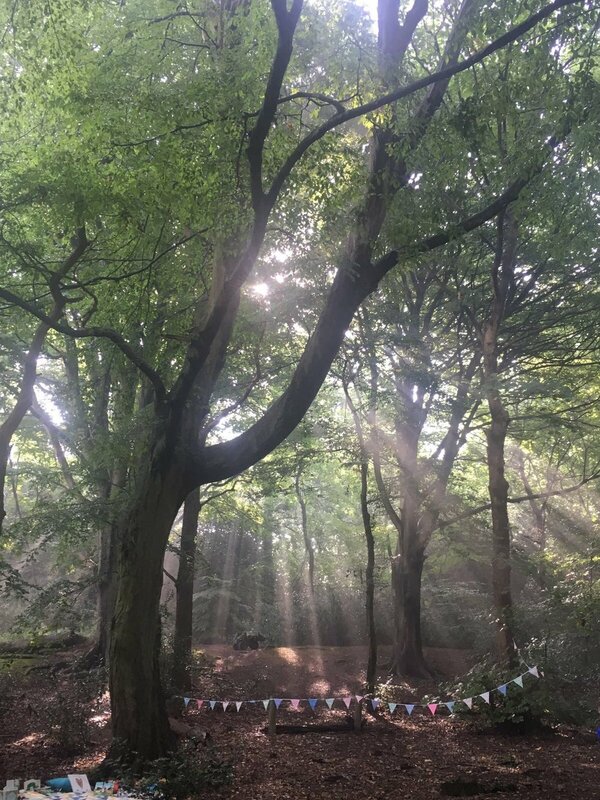 Paradise Co-op has cosy hiding spaces amongst the trees and we cook over our campfire whilst at this site as well as examining all of the fabulous minibeasts and flora and fauna. We enjoy lots of creative play on this site. On Tuesdays, Wednesdays and Thursdays our children spend their days in the wilds of Wimbledon Common. This is an altogether different experience and focuses on exploration, adventure, minibeasts, freedom to roam.....and lots of climbing fun! Our indoor premises from which we run our Little Forest Folk Wandsworth full days is the Magdalen Road Bowling Club. Our children enjoy breakfast and dinner as well as some free play and maybe even some barefoot bowling at our lovely indoor premises before on Mondays and Fridays being walked across to the Paradise Co-op or Tuesdays, Wednesdays and Thursdays taking a drive in our minibus down to Wimbledon Common for some forest fun. We enjoy a morning snack, lunch and afternoon snack out in the forest as well as making sure we drink lots to keep our busy little bodies fuelled and hydrated for our very active days. Our afternoon snack time is not only a wonderfully social time for us as all meal times but is also a chance to reflect with our children upon our day. We discuss what the children have enjoyed, what they have learned and use these discussions to help us plan our activities and resourcing for the next day. On Mondays and Fridays, we do have the ability to accommodate 1-2 hour sleepers, for Tuesdays, Wednesdays and Thursdays we are more adventurous and nomadic so will simply provide rest and relaxation areas. There are two options for attending Little Forest Folk Wandsworth, a Full Day or a Sessional Day. Full Days run 8am to 6pm, include breakfast, lunch and dinner, whereas Sessional Days are shorter days running 9.30am to 3.30pm, that include breakfast and lunch. Both include a morning and afternoon snack. We ask for a minimum commitment of at least two days per week per child. Sign up with your email address to receive general news and updates from Little Forest Folk. We use the Bowling Club as our indoor premises from which we run our Little Forest Folk Wandsworth full days. There is parking next to Paradise Co-op for drop off and collection. The Windmill car park is available for all day parking. Sign up to our newsletter and we can let you know when the next site visits or open days are available for all of our Little Forest Folk nurseries. As a social-purpose business, Little Forest Folk offer a limited number of free places for full-time childcare to qualifying two-year-old children. If you are eligible for two-year-old government funding you will be eligible for our Little Forest Folk programme of free places. These hours will be provided from April 2018. There are currently two options for attending Little Forest Folk Wandsworth, All year round Full days (51 weeks a year) or term time only Sessional days (38 weeks a year). We ask for a minimum commitment of at least two days per week per child. We run holiday camps during school holidays at our Wandsworth nursery. If you'd like to learn more about our holiday camps, please follow the link below.